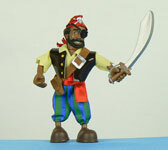 GREAT PIRATE ROBERTS with gold coin and sword. Bend and pose to play toy with collectors card inside the box. Choking hazard-small parts. Not for children under 3 years old! SAFETY INFORMATION: These toys are designed in the USA. Rigorously tested for safety at an accredited independent toy testing laboratory. All the products comply with and meet or exceed the safety requirements set by the U.S. Consumer Products Safety Commission (CPSC) as well as standards for Canada and the EN71 European standards. Products also comply with the more stringent voluntary toy safety standards known as ASTM F963 (www.astm.org). Bartholomew Roberts, known as the Great Pirate Roberts, plundered hundreds of ships from Africa to Brazil to North America. Unlike most pirates of his day, Captain Roberts was well educated and considered a true gentleman. But he was bold and fearless. He once sailed his ten-gun ship into a Newfoundland harbor with black colors flying, drums beating and trumpets sounding. The crews of the 22 ships in anchor were terrified and fled. Captain Roberts aggressive nature turned him into one of the wealthiest pirates ever. He did not just sit and wait for ships to prey on. Instead he went in search of lonely vessels to attack. The Great Pirate Roberts pirating days came to an end when he was killed off the coast of Africa. Upon his death, the crew burst into tears at the loss of their beloved captain.